Basscraft Jigs - Good, solid jigs that work! With lure costs rising like the price of gas, why pay more? Basscraft jigs feature Mustad Ultra Point hooks and are HAND-TIED. No rotten rubber collars or skirt slippage during hook sets! A hand-tied skirt is a must for skipping jigs. Available in 1/8 oz (2/0), 1/4 oz (3/0), 3/8 oz (4/0), 1/2 oz (5/0) and 3/4 oz (5/0). Color-matched heads in black, brown, green pumpkin and white. Weed guards and skirts are full-length. You can trim them to suit your fishing style. $2.99 each Save big by purchasing a Card of 6! Add a rattle for $ 0.30 Ordering instructions at the bottom of the page. Texas Craw. Mossback, and Sour Candy colors updated! Use the menus and "Add to Cart" button to purchase your jigs. Use the drop-down menus to select your jig weight and skirt color. To add a rattle or purchase a card of 6 jigs, select "YES" to the appropriate option box. For a single jig without rattle, all options should read "NO". Then click "Add to Cart". You may review your selection and specify a quantity in the following Paypal screen. Use the continue shopping feature to return to this page for further purchases. Call or email with questions. Weight 1/8 oz.1/4 oz.3/8 oz.1/2 oz.3/4 oz. All skirt colors are available in a 2-pack, rubber collar banded, on the accessories page! Rattles too! Basscraft recommends BatwingZ trailers from Z-Man! 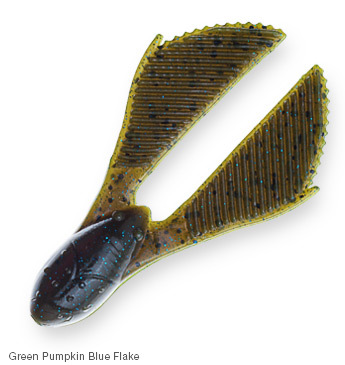 Featuring uniquely textured, buoyant ElaZtech pinchers that float up off the bottom, BatwingZ jig trailers accurately mimic the natural defensive posture of a crawfish and turn any jig into the perfect stand-up jig. The versatile body shape allows for various rigging methods, and 10X Tough ElaZtech durability keeps you fishing during a hot bite rather than searching for a replacement jig trailer. Click HERE to purchase.